Reason Number One is that Iowa is my 49th state! Having skirted all around it over the years, I’ve never had a reason to visit the “heartland.” So being in the adjacent state of South Dakota, I figure it’s time. But there are more valid reasons to visit Iowa than just tagging a 49th state…and here are just a few of them. 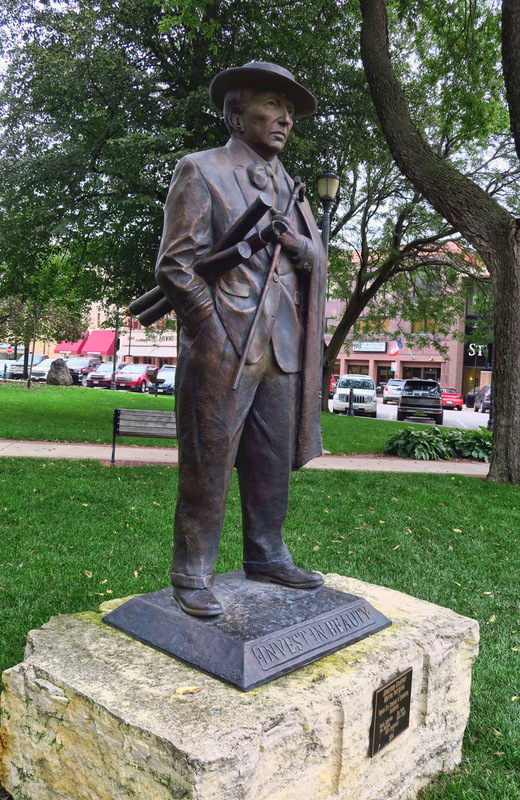 Frank’s statue graces the main square of historic downtown Mason City. The historic Park Inn and City National Bank Complex, downtown Mason City, IA, Wrights last remaining hotel of six left in the world. 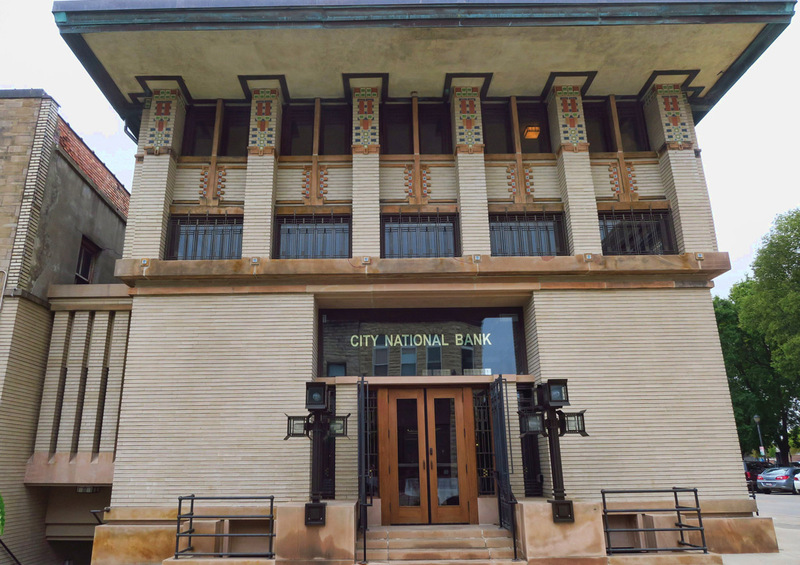 The architect has two prominent buildings open to the public in Mason City, the most noteworthy is the Park Inn Hotel and City National Bank complex, constructed in 1910 along the main square. Wright designed six hotels during his lifetime including the Imperial Hotel in Tokyo. This one in Mason City is the only one remaining in the world. The original complex incorporated a 42- room inn (operating today as a smaller boutique hotel,) lawyer offices (now the hotel’s wine cellar and library) and bank (now the hotel ballroom) in one well-integrated design. Most of Wright’s work is concentrated in Oak Park, IL, or in the neighboring state of Wisconsin. So why Mason City? Two daughters of one of Mason City’s prominent attorneys attended the Hillside Home School in Spring Green, WI, a school Wright designed for his aunts. The attorney was an admirer of Wrights work, and commissioned him to build the City National Bank and the Park Inn Hotel complex, incorporating the attorney’s office into what they called the “waist” in between the two. The hotel lobby used to be a cafe. 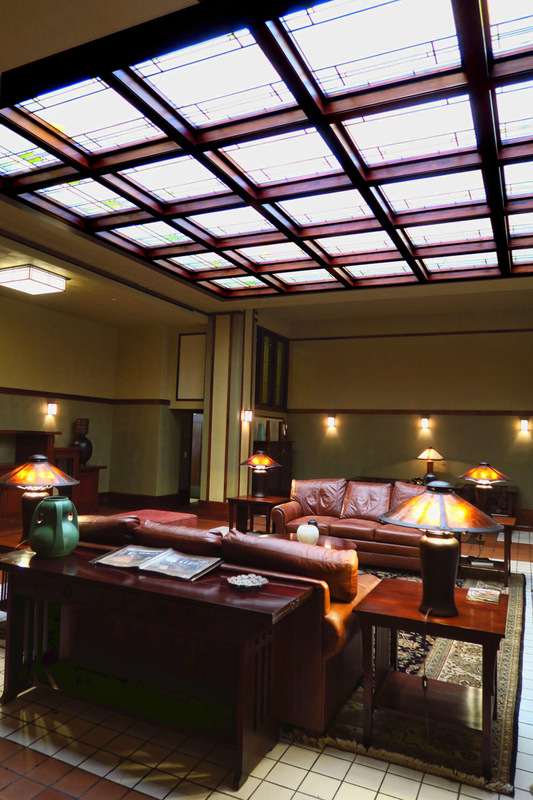 The floor and the art glass skylight are the only original fixtures that remain in the lobby. 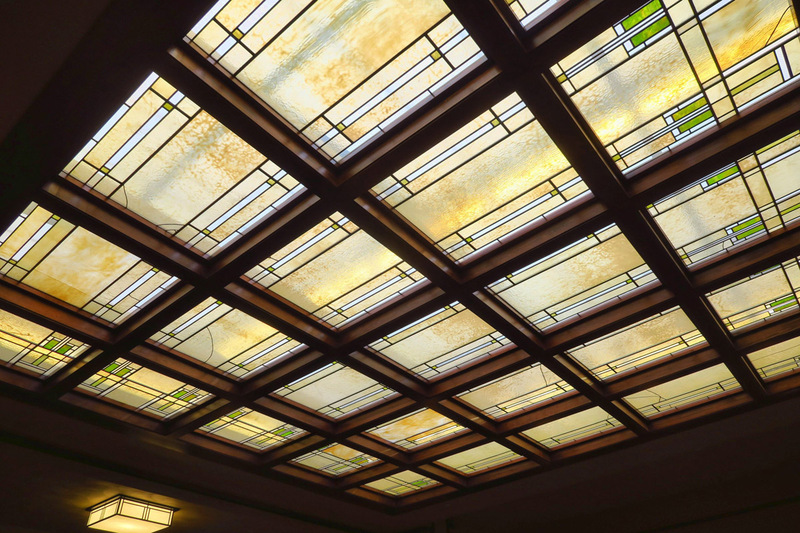 All 25 panes of the art-glass skylight were still intact from the date the hotel opened in 1910. Wright on the Park now owns the property and leases it to the hotelier. Both the bank and the inn were hit with hard times during the 1920’s when the farm crisis caused failure of banks across Iowa. The hotel also fell into disrepair, leading to a lineage of changing owners trying various venues. Finally, in 2005, the complex was placed on the National Register of Historic Places, and Wright on the Park, the non-profit organization responsible for the restoration of the bank and hotel complex raised 18.5 million to restore the complex to its original state. 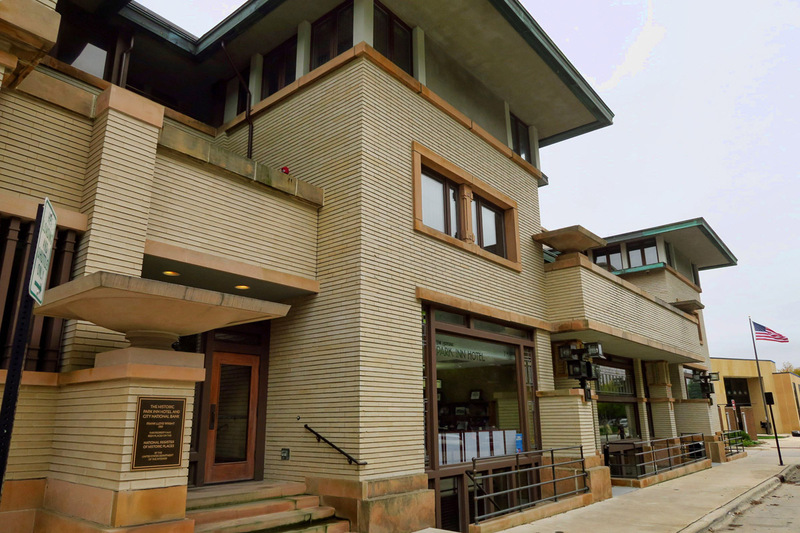 One of the things that strikes me about the Frank Lloyd Wright style is its timeliness. These buildings, built over a hundred years ago still stand the test of time. Around the corner from the hotel entrance is what was the City National Bank. It was to appear like a “strong box” with no windows on the first floor. 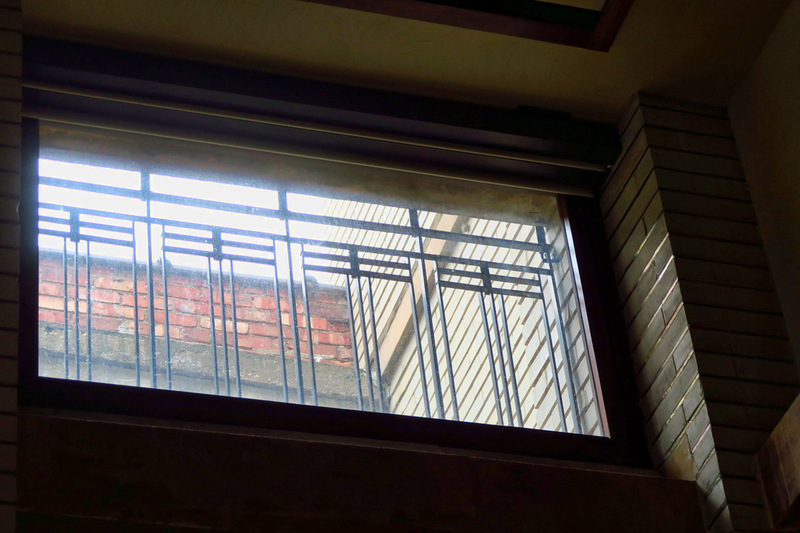 The grates on the upper clerestory windows are original. Also note the iridescent gilded mortar between the bricks in the columns on the right. This was to reflect light onto the lower floor which had no windows. These art-glass panels were used to divide bank offices. The former bank now serves as the hotel ballroom. 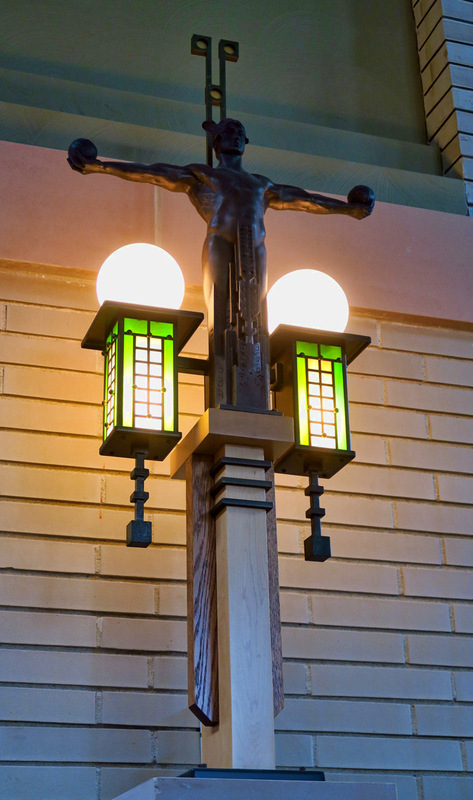 The “teller cage” in the center of the bank lobby was topped with four of these “Mercury” statue light fixtures. Two originals remain, one in the Mason City Public Library, and the other a part of a private collection. But neither wanted to relinquish their artifacts, so the Library loaned their statue out for the purpose of replication. Across the street from Rock Crest/Rock Glen is the Stockton House, designed and built in 1908 by Wright for Dr. George C. and Eleanor Stockman, the neighbor of one of the lawyers who commissioned Wright to build the hotel and bank complex. In keeping with the style he made famous, the house demonstrates the “compression and expansion” principle of keeping entrances to rooms low and compact, then exploding into vast open rooms ringed with ribbons of windows. Just as with any Wright designed home, the details in the design, proportion, and symmetry are remarkably impressive for 110 year old design. The Stockman House, built 1908. The house shows off many classic FLLW features…the low hipped roof, cantilevered eaves, ribbons of windows, hidden entrance-way. 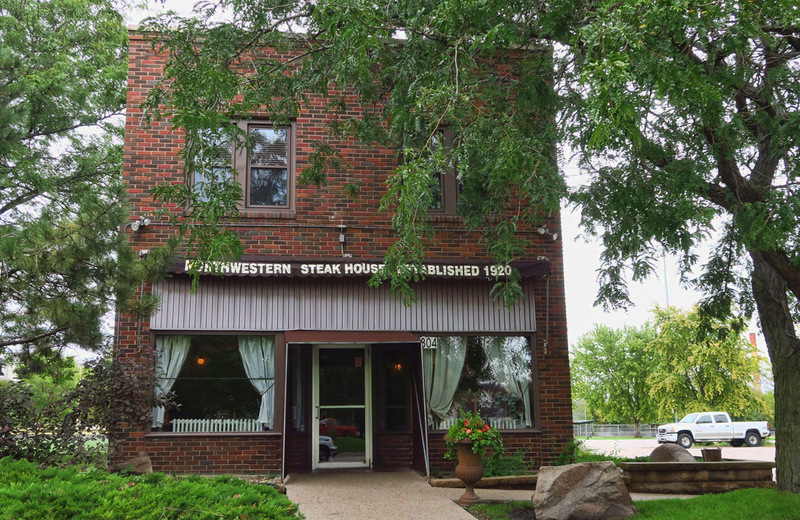 On to the next reason….which is not really a legit reason, but if you happen to be in Mason City Iowa, AND you are a shameless carnivore like I am, don’t miss Northwestern Steakhouse. I learned about it from a magazine article as “the most iconic restaurant in the state.” It’s been in business since 1920, offering a unique menu of Greek-style steaks, which means bathed in garlic and olive oil. You might need a liver cleanse afterward, but it was worth it. What else about Iowa left an impression? Miles and miles of two lane roads turning 90 degree angles through walls of golden corn fields. I had to laugh when my GPS would direct me to “Turn right on 100th Avenue and 490th Street” as if it were some major avenue in a big city, only to discover it was barely a paved road between the corn rows. 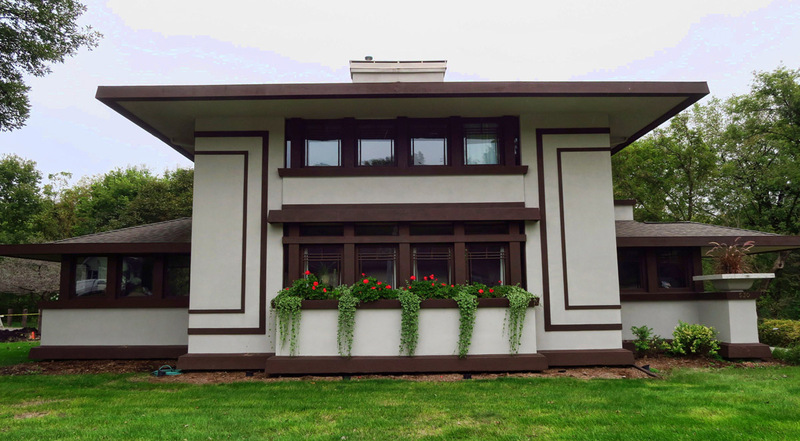 This entry was posted in Iowa and tagged Frank Lloyd Wright, Mason City, Northwestern Steakhouse, Park Inn Hotel, Stockman House, Wright on the Park by Suzanne. Bookmark the permalink. Fallingwater, a Frank Lloyd Wright house in Pennsylvania – 40 odd miles southeast of Pittsburgh. That is a beautiful house in a beautiful setting. Bet you would enjoy a visit there, too. Frank Lloyd Wright’s house Fallingwater, 40 odd miles Southeast of Pittsburgh. Beautiful house, beautiful setting, just Wow. The Preston Gas Station in Belle Plaine, a holdover from the days of the Lincoln Highway. The tiny but unique concrete Lincoln Highway Bridge in Tama. The Boone & Scenic Valley Railroad in Boone. The Kate Shelley High Bridge (RR) just west of Boone and the incredible story of a teenage girl’s efforts to prevent a passenger train from plunging off a washed out bridge. These are just a few of my blog posts from a trip through the state and, as you might be able to tell, I too found many things to enjoy about Iowa. I thoroughly enjoyed Pella, Iowa and the near by state park. or Lichstinn’s RV and the mothership for Winnebago owners in Forest City with a great factory tour. There is really a lot to see in Iowa. We spent three weeks there three summers ago… just ask. 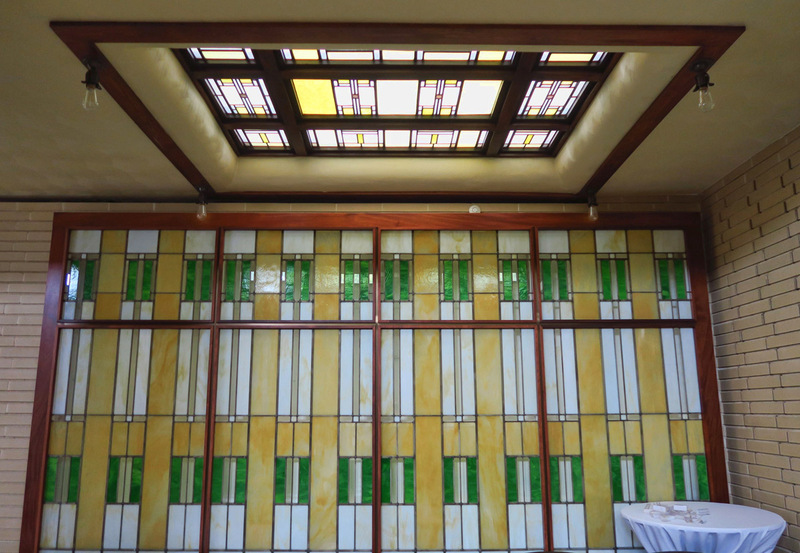 The hotel staff will gladly point out which fixtures and glasswork date from Wright’s original construction. In doing so, one can receive a good tour of the property. And did the couches in the lobby look familiar? They’re from Stickley and you sat on one in Corinne’s and my living room. South from the Stockman house, did you also take note and photos of the Wright-inspired development? Mason City is a gem, no doubt about it. 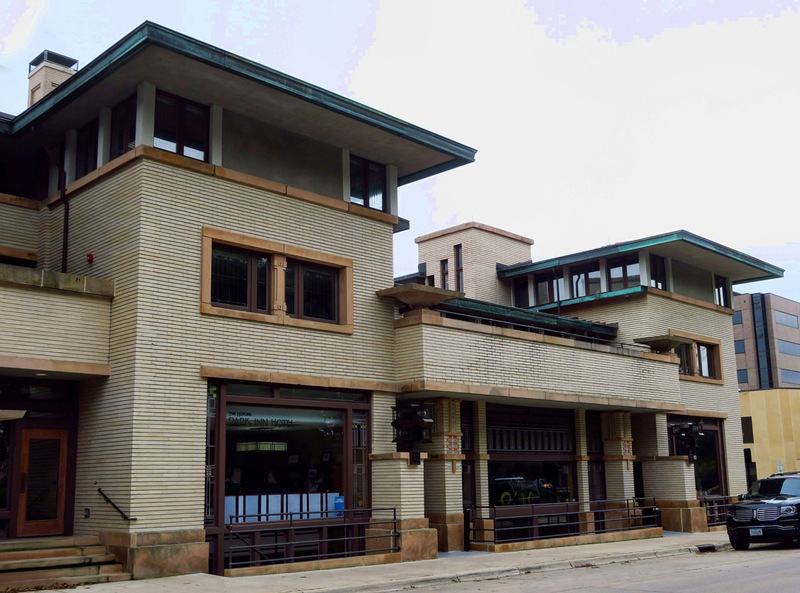 Frank Lloyd Wright architecture is a good reason to visit a location. It was interesting to see what others had to offer up as places to visit in Iowa. Obviously I am woefully inept at all times Iowan. 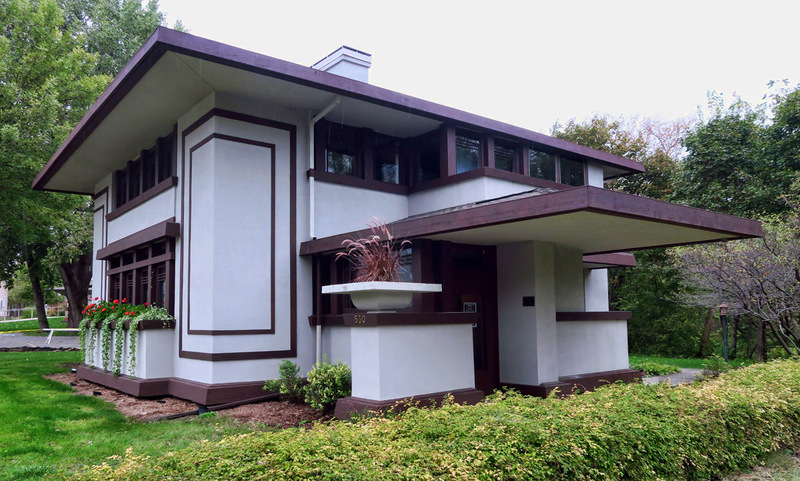 Thank you for the interesting commentary on Frank Lloyd Wright and his contribution to Mason City, Iowa….the photos are lovely!